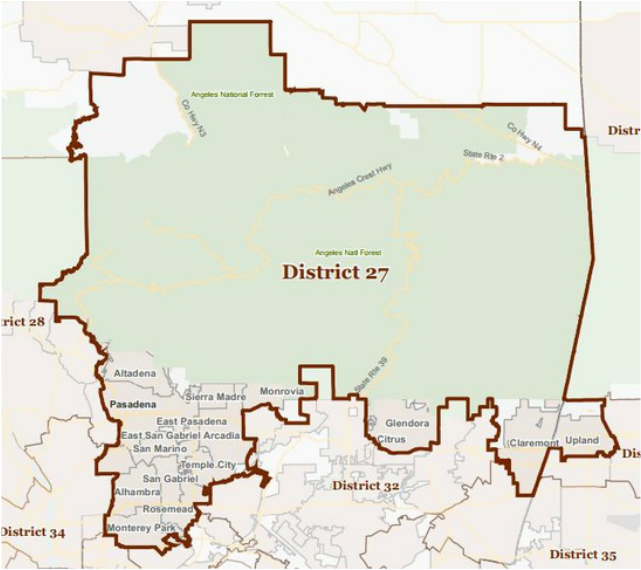 Democrat Judy Chu currently represents Congressional District 27. Chu is expected to easily win re-election in 2016. Judy Chu was elected to the U.S. House of Representatives in July 2009. She represents the 27th Congressional District, which includes Pasadena and the west San Gabriel Valley of southern California. Rep. Chu currently serves on the House Judiciary Committee, where she is a member of the Subcommittees on Intellectual Property and the Internet as well as Crime, Terrorism, Homeland Security and Investigations. She also serves on the House Small Business Committee, which has oversight of the Small Business Administration. Rep. Chu is the Ranking Member on the Subcommittee on Economic Growth, Tax and Capital Access. She is also a member of the Subcommittees on Contracting and Workforce as well as Investigations, Oversight and Regulations. In 2014, after years of work and outreach, Chu introduced legislation to create a National Recreation Area to preserve and sustainably expand access to the San Gabriel Mountains. President Obama followed Chu's call for permanent protection and declared much of the area the nation's newest national monument.